The Residences at Christina Landing’s downtown Wilmington apartments put residents a stone’s throw away from all of the opportunities that the bustling metropolis offers. While there’s plenty to see and do right at home, the community is just steps from Wilmington’s flourishing arts scene and its diverse shopping opportunities. Any city experiencing an arts and culture renaissance can also expect a boom in another area: dining—and Wilmington is no exception! Residents of The Residences at Christina Landing can satisfy their inner foodie with dozens of world-class culinary opportunities, all just moments from home. The Residences are situated right along the banks of the Christina River, where a number of restaurants have opened shop to take advantage of the picturesque background and prime location of the Riverwalk. Right on the other side of the river is Banks’ Seafood Kitchen and Raw Bar, which focuses on freshness and fun—both in its ingredients and atmosphere. Its outdoor patio is a popular gathering space for diners who want to take in the beauty of the riverside views while they enjoy Banks’ award-winning fare. When the weather is nice, Constitution Yards is another coveted spot. The seasonal beer garden features 30,000 square feet along the Riverwalk where diners and drinkers can take in summer-themed snacks, salads, sandwiches, and craft drinks while enjoying a range of backyard games. Downtown Wilmington apartments like The Residences at Christina Landing are also just blocks from the booming restaurant scene in the heart of Wilmington. The area offers a nice mix of longstanding culinary staples and trendy newcomers. 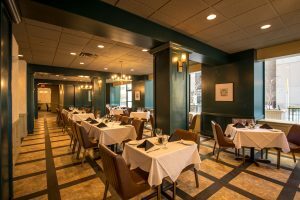 The Green Room at Hotel Du Pont, situated in the more than 100-year-old hotel, offers a four-star experience that has become one of Wilmington’s premier dining destinations. Domaine Hudson is another elegant option, combining fine wine and fine dining for an unforgettable experience, while Chelsea Tavern is a favorite for down-to-earth eats. Newer to the scene are options like Merchant Bar, which has made a name for itself with its craft drinks and international flavors, and Tonic Bar and Grille, popular for its perfectly seared steaks. No matter your tastes, at our downtown Wilmington apartments at The Residences at Christina Landing, you’ll be satisfied with the local culinary creativity!